Somehow I made it to LA, but it would appear I brought half of what I own with me. WHY do I need all this stuff? If you inventory the items visible, you note my green tea (they may not have my breakfast drink here in this neck of the woods); the hanging clothes draped non-ceremoniously over the top; the basket of shoes; the bin of toys needed for bike riding, hiking on road and off road, water bottles for the bike, water belt and bottle for hiking, the swim bag, a suit case filled with clothes for church, clothes for dinner, clothes for hot, clothes for not as hot, clothes to work out in, clothes to play in, and clothes to sleep in; the bag with all my needed swim stuff AND what you don't see the back pack filled with my technology stuff, the basket with all the essential make up, hair stuff, etc, the bike pump, and the bike. I estimate about 50-60 pounds of stuff-at a minimum--NOT including the bike. I will be here 4 weeks not 40 years (wandering in the desert--remember). Contrast that to last year's three weeks in Europe with one suitcase weighing 22 pounds and one carry on bag. Amazingly I did not miss all the stuff I left behind AND got along quite well for three whole weeks without adding one item. There seems to be a message in this huge contrast. I am NOT an nomad! If given the opportunity and ability I would drag all my stuff every where I go. 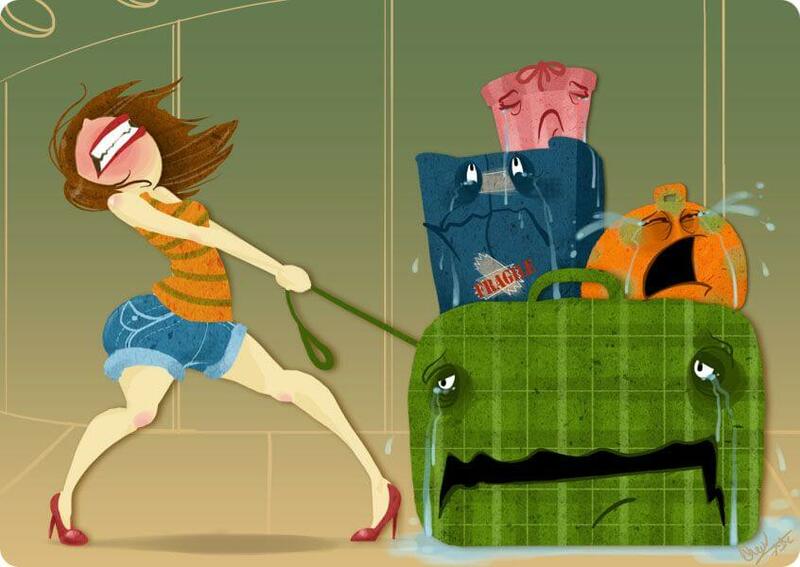 I am a gifted light packer when it comes to short trips of a week or less, but when you begin to lengthen the stay, I begin to over function when it comes to the necessities. The ONLY way I was able to limit my packing in Europe is the trip planner FORBID us to take more than 20 pounds. When you are dragging your own luggage, never taking a taxi, and running to meet connections--it was a necessity to lighten the burden. When thinking about God's Chosen People wandering around the wilderness for FORTY long years, I began to wonder if there was a trail of stuff marking every step of their journey. You KNOW after a period of time--dragging all that stuff around HAD to get old. That extra tunic might not be needed if you wash the one you are wearing once a week while resting. Tents are highly over-rated--why not sleep under the beautiful stars. Who needs pots and pans when God is providing the grub. Forty years of lightening the load! Anything to make the trek easier! What stuff am I currently dragging around that is a burden? Is there unresolved anger weighing me down? Have I not ditched the pain and hurt from old grievances? Have I allowed the unfairness of life to become a ball and chain around my neck? Am I dragging unconfessed sin along for the ride? How could I lighten the load? How much easier this trek through life would be if I adhered to the "Light is Right" philosophy of travel. Why do I refuse to leave the other behind when it only weighs me down? What baggage are you dragging around? What sorrow for those who drag their sins behind them with ropes made of lies, who drag wickedness behind them like a cart! Try as much as we can, we all carry heavy baggage from the past with us. Unresolved issues, pent up hidden anger from unjustices donme to us, we may not show them to others, we may claim we have forgiven, but the hurt of that injustice still lingers on. It's part of our human nature to remember and to feel the hurt once again. Maybe it is a reflex action to ensure we don't get hurt again. As for Moses and forty years to travel a short distance. Maybe God allowed it so in order to get a new generation to enter the Promised Land. In those days life expectancy was much shorter. And in forty years, those people who had left Egypt, and still carried the memories of their life there, would have died; and new generation, not having experienced their parents' slavery, were ready to enter a Promised Land unencumbered by their parents' hurts, regrets and heavy baggage. Have a most wonderful holiday, Lulu. God bless you. I love your paragraph about the Israelites ! The Word tells us the old generation was not allowed in to The Promised Land and as you say they were "unencumbered". Love that word description! Oh boy....another your talking to me post...Praying that your 4 week vacation will be a good one, my friend. I am always preaching to myself first! Plan to have a great visit!! Thanks for the shout-out this week, Lulu ... and for sending your tribe over to visit. Happy trails to you as you venture into another adventure! Can't wait to hear your stories, your learnings. Always glad to tell others of inspired writings! I have already been inundated with future post topics!